Greenlighting a fake film. Hollywood special. Explaining the plot to non-believers who have no choice. Argo is a surprisingly LOL film about the execution of a 1980 plan to rescue six American hostages from the Canadian Embassy in Teheran. And not incidentally about the mad world in which we live. Hollywood is the star here. 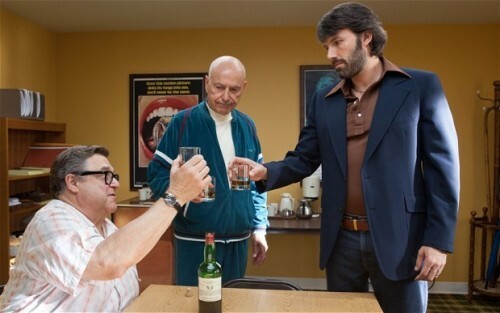 An aging and out of date producer played by Alan Arkin, and John Chambers, a famed makeup artist portrayed in a brilliant turn by John Goodman, cooperate with CIA operative Ben Affleck to pull this off. Affleck is unemotional and even flat as a CIA agent who cooks up this scheme. Maybe it’s his idea of how undercover operatives work. 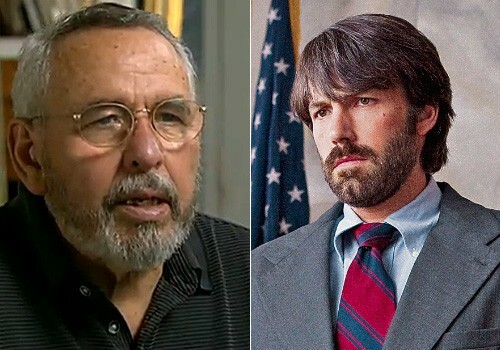 Tony Mendez, the real character Affleck plays, is now too old to determine whether or not he was as over the top as his plan. It suggests that CIA agents train to be even-tempered, even when the Revolutionary Guards are in hot pursuit. Chris Terrio's dialogue, particularly in the Hollywood studio and at CIA headquarters, is punchy and fun. It surely reflects the movie business. "The script is in turnaround" drew howls from an industry audience at a screening in New York. 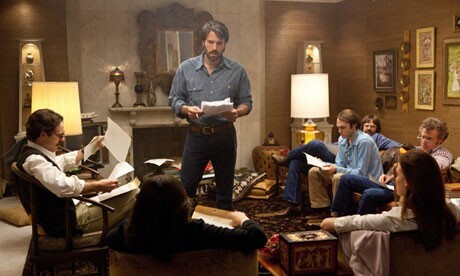 Affleck introduced the film looking to all the world like a CIA agent. Both Hollywood and the CIA are presented as all male worlds that are not even real in 1980. The language is so crude that women had to be excised. Reports from the Navy seals “Neptune Spear” raid that killed Bin Laden include a female operative who cried after Bin Laden was shot to death in the head and then nailed to the floor by multiple bullets to his body. (Ensuring no trial for Bin Laden). When the film tries to capture the real situation like rioting crowds waving hate American signs it is very good indeed. When it veers into fabrication, it feels fake. Parallel story lines, cutting back and forth between the hostages escape route and Iranian security forces closing in on them, are there for drama but don't always provide it. Haven't we learned by now that reality can be entertaining. Director Affleck, for some reason, does not always pick the best camera angles or cut them in a way that enhances the story. As compelling as the dialogue is, the film's technique is often not realistic, or even faux amateur, and just plain bad. Yet the story pulls the audience along, and you want to cheer when Tony Mendez gets a secret CIA version of the Medal of Honor. George Clooney was a co-producer on the film. The postfilm titles, lauding cooperation between countries, may well have been his reason for his support. If no one else gets a popularity bump from this film, Hollywood will probably embrace its own and hire Arkin to produce, and Goodman for makeup, in future sci-fi films. On a more serious issue, you wonder after Libya, what the Arab Spring has sprung?